I attended this Christmas Cooking Workshop conducted by Ms. Irene Jansen last year, costs $40 per pax. It was held at Meritus Mandarin Singapore Hotel. There was about close to 200 attendees, mostly women. Life cooking demonstration by Irene, with buffet lunch of the dishes featured in her cooking workshop. Good workshop, and I learnt a Spicy Chicken Stew from this workshop. This Spicy chicken stew is not exactly spicy as its spiciness comes from the black pepper added. No curry power, no chili used. Hence, I have renamed it as Five-Spice Chicken Stew, with a little modification of ingredients/ condiments used in this dish. This so-called Christmas dish is actually more like the Chinese stewed chicken, to me. The spices used in this dish simply resembling the Chinese five spice stew meat, with western dish layout i.e. carrot and potato added, and served with mashed potato. Be it spicy chicken stew or Five-spice chicken stew, this is indeed a very delicious, fragrant, flavoursome and super soft & tender chicken dish!! Anyway, since Christmas is approaching, give it a try on this coming occasion, if you are not going to celebrate it elaborately. Or, eat it anytime! Taste its soft and tender chicken meat with full flavors penetration after boiled for hours. The sauce goes too well with hot steamed rice (1 bowl of rice would never be enough.. laughing) which could really whet your appetite. I will guarantee your pleasant meal time with this delicious dish. 1) Heat a pot over medium fire. Add olive oil, garlic and shallot, stir fry for 3 minutes, until fragrant. Put in chicken drumsticks and sauté for 5 minutes until the skin is slightly crispy. Then, add in chicken stock and water. 2) Place carrots and potatoes in the pot. Add in star anise and cinnamon sticks. Bring it to a boil again. Add the black pepper, oyster sauce, light soy sauce, Hua Diao rice wine, and sprinkles of salt. 3) Reduce heat to low fire. Let the chicken stew simmer for 2 hour with lid or tilted on the pot, till chicken drumsticks, carrots and potatoes are completely soft and tender. Stir-in corn starch slurry to lightly thicken the sauce. Heat off, and remain lid on for a couple of minutes. Serve hot with steamed white rice, or just have it by its own! This dish is easy, and quick to prepare. You can consider this as 1-dish meal since there are meat and 2 kinds of root vegetables in the meal. 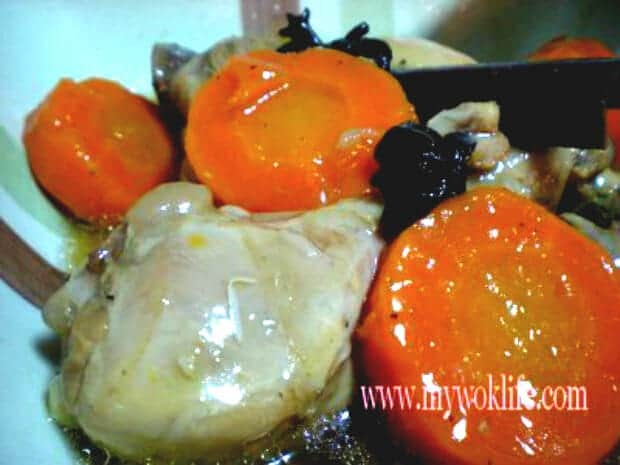 Serving of 1 stewed chicken drumstick with some carrots and potatoes yields about 300kcal. I prefer to cook the chicken drumsticks with skin removed, to reduce oil intake. You may use chicken wings, too! I love it with chicken wings as the taste will penetrate easier than any other chicken parts. Slowly remove the wings from pot when served as these wings are too well-cooked and tender that easily disintegrate, after 2 -3 hour boiled. I prefer chicken wings in this recipe indeed! Tips: The liquid of chicken stew will reduce to half when simmer without covering with the lid. If you prefer more sauce, simmer with lid fully cover, or tilted on the pot. * Add in 1 teaspoon of dark soy sauce if darker sauce colour is desired. Try to reduce the amount of salt, if dark soy sauce is added. * If you intend to cook this dish during weekdays after work, marinate the chickens with light soy sauce overnight. Boil the chicken with medium-low fire for just an hour next evening. *Alternatively, place all ingredients in croak-pot and set slow cooker to auto shift or low heat, in the morning before setting off to work. ← Chicken Stock Cube with No MSG? You are most welcome. Don’t mention anymore. I am more than willing to share with you. And, happy to see your interest in cooking increases more and more each day! This is indeed a super easy, express and delicious dish you must try! As for the cinamon stick and star anise, go grocery store at neighbourhood to get those already in packet ones. A small packet consist of 2 cinamon sticks, few small star anise and few seeds in the packet. Tel the store keeper, you need this “wu xiang, gui pi, ba jiao 五香桂皮八角” in a packet one, used for “lu rou 卤肉”.. Use a packet, and you wil have this nice dish done sucessfully. For this dish n the Kung pao chicken, am I able to use pork instead ? That’s a very good question. Hmm… I think you cam basically use any choice of meat, but I personally think it will taste best with chicken than any other meat. Same to Kung Pao dish, but for Kung Pao flavour, some like it with lightly fried pork slices or fried fish. I do. Hi. Thanks! For party snacks, it depends on whether to make for my daughter’s friends or my adult friends. For her almost teenage friends, I made Konnyaku jelly with fruits cocktails, hotdog with opened flowery ends design (as decorations), chicken nuggets, sotong balls, egg sandwiches. For my adults friends, I made prawn & ham veg rolls, Konnyaku jelly with bird nest, MWL specialty fried bee hoon, cucumber sandwiches, mini almond tarts and cookies, and etc..